For the past few years in our regular physics classes, students have struggled to complete the “Pendulum Energy Lab”. This lab involved setting up a mass hanging from the ceiling by a string. Students were asked to shoot video of the mass as it swung back and forth. They then analyzed the video to compute potential energy and kinetic energy at various points during the swing. The problem was that to get the height and speed, they would have to set up multiple meter sticks at lots of different crazy angles, and then have to deal with blurry video. The lab that was designed to show a simple concept ended up being so complicated and taking so much time that most students completely missed the point. This year we decided to shoot high-quality video of the lab to see if we could distill things down to their essence and eliminate the blurry meterstick mess. The result is the new “Pendulum Energy Lab” video. Students must still measure height and speed, but this time the measuring devices are perfectly positioned and are easy to read. 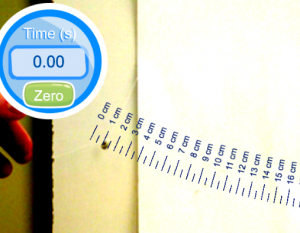 Students can easily scroll through the video to record height, position, and time. We have included a paper copy of the activity which prompts students to create a data table for potential and kinetic energy at various points, then to create energy bar graphs. We are looking forward to trying the new lab in class on Monday!